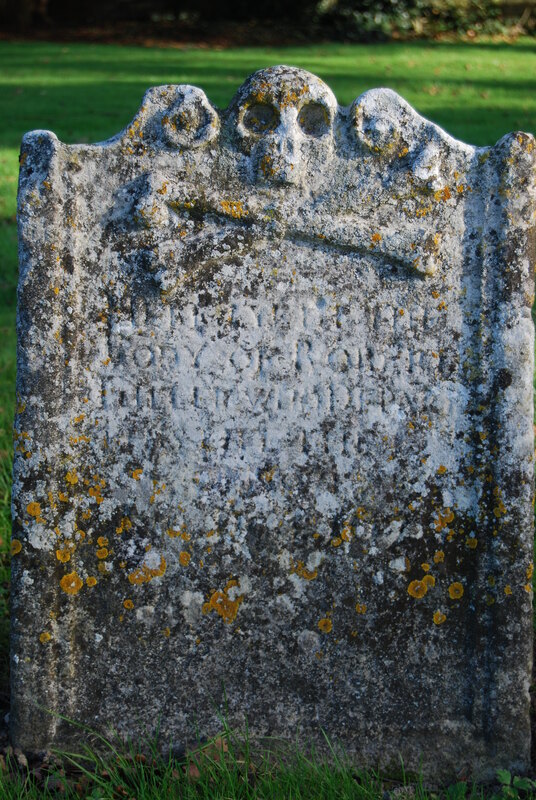 “Here lyeth the body of Robert FULLER who departed this life the 19thday of November Ano Dom 1678”. The headstone is now virtually illegible so it is impossible to verify if this date is correct. There are no other names on the headstone. 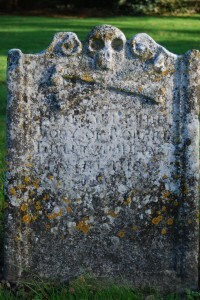 The fact that Fuller has a headstone, coupled with the description of him as a yeoman indicates that he was a man of some standing and wealth. In terms of social standing a yeoman is placed above a farmer but below that of the gentry. His status as a yeoman would have been reliant on the amount of land owned and probably the extent of his farming activities. It is also possible that Fuller may have had a second occupation as this would not have been uncommon at that period. It is not known if he married or had children. He did, however, leave a will and it has been possible to use this to gather some information about his family connections. He was the (youngest) son of Robert Fuller of Stonecrouch, who was also the postmaster for the area and well as being the occupier of several fields near Combwell which he leased from the Campion family. Robert Fuller, senior lived at a property called Coppins which he left to his son Robert in his will. The location of this has yet to be identified although we have to surmise it was in the Kilndown/Combwell/Chingley area of the parish of Goudhurst. 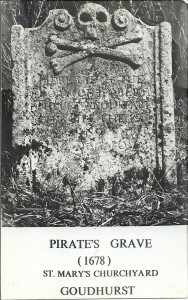 Robert Fuller of the pirate’s grave, made a will on 24th October 1678 indicating that he was “sick and weak in boddie but of perfect mynd and memorie” and this was duly proved in the Prerogative Court of Canterbury, on 27th November 1678. His will makes no mention of a wife or any children. He refers to his “father in law” George Needler to whom he left 40 shillings so that he could buy a mourning ring and to a “sister in law” Elizabeth Needler to whom he left £40. Having inherited Coppins from his father he left that to his brother-in-law Thomas Nokes, of Ticehurst, Sussex who had married his sister Elizabeth Fuller in Etchingham, Sussex in 1666. Thomas Nokes, is described as a weaver and when he died in 1688 he in turn left the property to his sons. Other members of the Fuller family mentioned in his will are the five children, (John, Sarah, Anne, Thomas, Dorothy) of his deceased brother, Nicholas, who were all left 20 shillings each to be paid within 6 months of Fuller’s death. Although he had several older brothers, none are referred to in his will, only the sons of his cousins i.e. Robert, John and Thomas, (sons of Thomas Fuller), and Anthony (son of John Fuller) who were both left £10 each to be paid to them within two years. Robert Fuller, senior (the father), was buried in Goudhurst on 29th September 1657. There is no gravestone and his age is unknown. His will, made 23rd March 1653, was proved in the Prerogative Court of Canterbury on 26th January 1658. 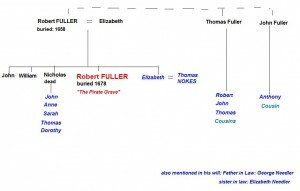 In it he refers to his eldest son John Fuller, his second son William Fuller, his third son Nicholas Fuller and his youngest son Robert Fuller, (aka the Pirate) who he also indicates was, at the date he made his will, under 21 years of age. Also mentioned is his youngest daughter, Elizabeth Fuller, who was also under 21. 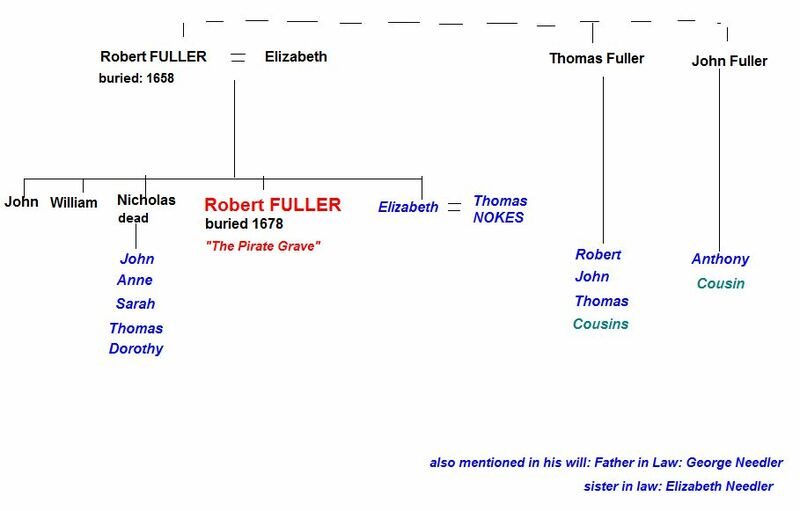 There is also a reference to three grandchildren, Thomas, Robert and John Fuller (the sons of Thomas Fuller deceased), his wife Elizabeth, was executrix and his son-in-law, William Rabson made overseer of his will. The parish registers confirm that An Fuller married Wylliam Rabson on 8th October 1632 and that Ann was baptised 18th February 1609/10. This Robert Fuller, also described as a yeoman, leased several parcels of land near Combwell, i.e. Pitfield (6acres) Furthest Pitfield (7acres) Middle Field (7 acres) Further Field (7 acres) at a rent of £10 10s 8d per annum, in 1649 (document unseen but catalogued on internet held in East Sussex RO). A similar document dating from 1623 (for 16 years) lists him as Robert Fuller of Goudhurst, postmaster renting, Smithfield, Stonefield, and the Burchett, part of Combwell Manor and Stone Crouch Farm but not the wood, at a rent of £64. 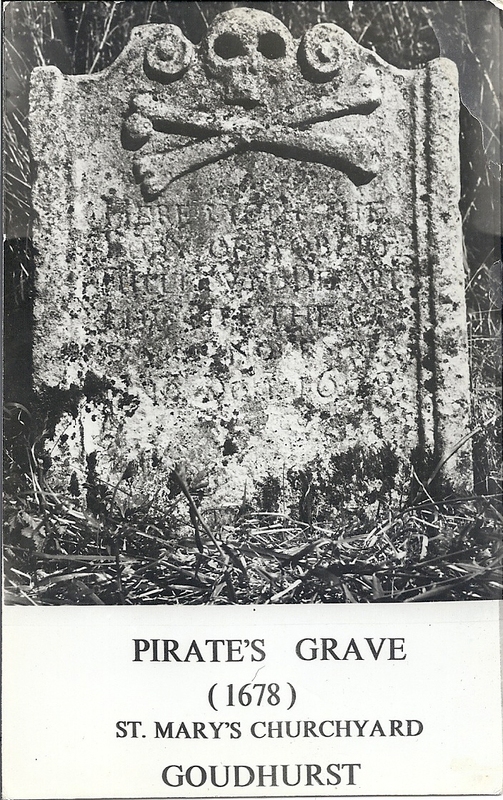 The burial registers also show that Nicholas Fuller was buried 31st May 1674 and that three of his five children, who had been left legacies by Robert, (the pirate) were also buried in 1679; i.e. Thomas (3rd Sept), Sarah (11th Nov) and Dorothy (6 Dec). Nicholas Fuller was baptised 25th May 1627 and appears to have been married to Ruth according to the baptismal entries for his children Anne (25th March 1666); Sarah (2nd August 1663); Thomas (26th July 1668) and Dorothy (19th March 1670/71); no baptism has been traced for his son, John. An inventory (held at The National Archives (PROB 4/9414) of Robert Fuller’s estate was taken on 25th November 1678. It mentions only “his purs and ready money” (value 8s 6d) ; “weareing Apparrell”; “one joyne chest and one little Firr box” and the amounts of money owed to him. Far from being a “Pirate” Fuller was probably a reasonably well off and respected member of the community.